Fruit tree are generous but fastidious trees, reciprocating their care with beauty and fruit. 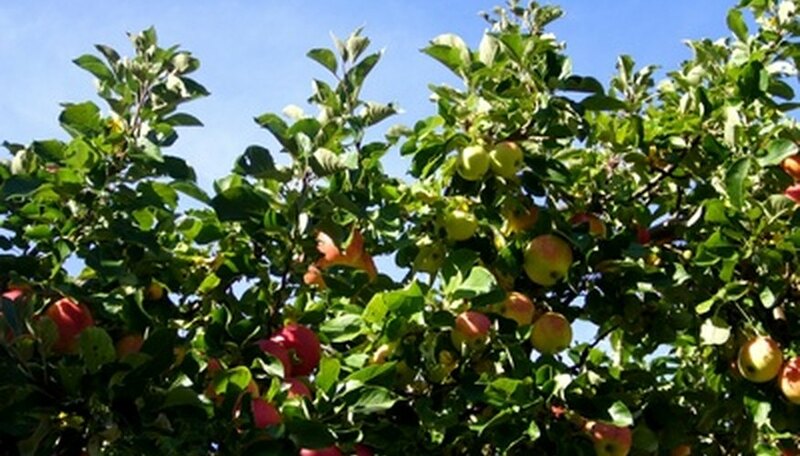 Although every type of fruit tree has its own specific care variations, the considerations needed to grow successful fruit trees are quite similar. A healthy location, generous watering and lots of sun are key. Select a warm, sunny location for the fruit tree--one that receives at least eight hours of full, direct sunlight. Choose a fertile, well-drained location that is free from settling water during long periods of rainfall. Prepare the planting location deeply by tilling or plowing the areas to loosen any compacted soil. Create a planting bed, as recommended by the University of California Cooperative Extension, that is about twice the spread of the tree’s root system. Create an extra-large planting bed if the tree has yet to arrive and you are unsure of the exact size needed. Inspect the tree thoroughly upon its arrival. Remove any excessive soil from its root system. Look for dead, dying or damaged roots. Use sharp, sterile pruning shears to remove damaged roots. Dig a hole for the tree that is slightly larger than the spread of the tree’s root system. Plant the tree as instructed by the University of California Cooperative Extension, ensuring that the graft union line of the tree remains about three inches above the surface. Backfill the hole about halfway with soil and irrigate the tree thoroughly to remove any potential air pockets. Repeat the process to complete the process. Press the soil firmly around your fruit tree to ensure its upright position. Irrigate the fruit tree regularly to maintain moist soil. Water the tree deeply to ensure that the water reaches your tree’s lowest and deepest roots. Use the recommendations of the University of California Cooperative Extension and create a water basin for your tree. Dig a shallow basin, around the tree’s diameter, that begins about 18 inches from the trunk and extends out to the tree’s drip line. Fill the basin with water about twice a month, adjusting for rainfall and drought. Begin pruning the fruit tree at planting and throughout its first five years. Use sharp, sterile pruning shears to head back the tree to less than 40 inches. Develop a strong central leader and remove any competing shoots. Develop an open-vase shaped framework so the limbs can support the developing fruit. Protect the fruit tree. Apply a layer of mulch around it to protect soil moisture and reduce weed invasion. Keep the mulch at least a foot away from its trunk to prevent rot damage. Remove any weeds as they appear. Pull the weeds by hand and ensure the root of the weed is removed to prevent regrowth. Keep the area free of defoliated debris to reduce the potential for disease. Feed the fruit tree as demanded by the specifics of your tree. Choose a well-balanced fertilizer to feed the tree at least once each year in the early spring. Follow fertilizer instructions and never overfertilize as this will cause root burn.